DFW Landscaping was originally founded in 2005 by owner James Watt of Richardson, Texas under the business name of C-Saw Construction. Specializing in both residential and commercial construction at affordable prices, James grew his business from a single employee to working with some of the best residential landscape & construction firms in the Dallas area through word of mouth from satisfied customers in Frisco, Fort Worth, North Dallas, Uptown, Irving, Coppell, Arlington, Mesquite, Garland and everywhere in between. We also deal with palm tree maintenance. "Do you do landscape design?" 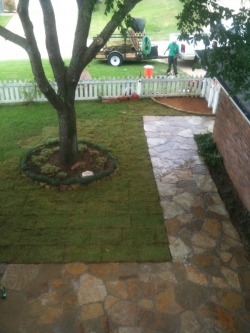 DFW Landscaping represents the third stage of James Watt's vision. We are proud to offer affordable landscape design to the people of Dallas and Fort Worth and look forward to earning your business in the same way we always have: through hard work, consistency, and affordable pricing on your next landscape project. Call us today and see what countless customers in DFW already know: You won't find a better landscaping company in Dallas! Our trained professionals are ready to serve you.